Arthur was born in the September quarter 1893, the son of John Edward (Carter for Council) and Mary Ellen (née Howsley) Williamson. He had an older brother, George Alfred, and an older sister, Edith Annie, and in 1901 (Census RG 13/3269) the family was living at 64 Bennett Street, Buxton. Ten years later (1911 Census RG 14/2122) Arthur was working as a "General Labourer", living at the same address with his sister and his father. His mother, Mary Ellen, had died in the December quarter 1902. "The Buxton Advertiser" (11th November 1916) reported that: "He is a single man and before joining was a Council employee." Arthur enlisted in the 13th (Service) Battalion at Buxton and his Service Records do not appear to have survived. His Medal Index Card shows that Arthur was posted to France on the 1st September 1915. 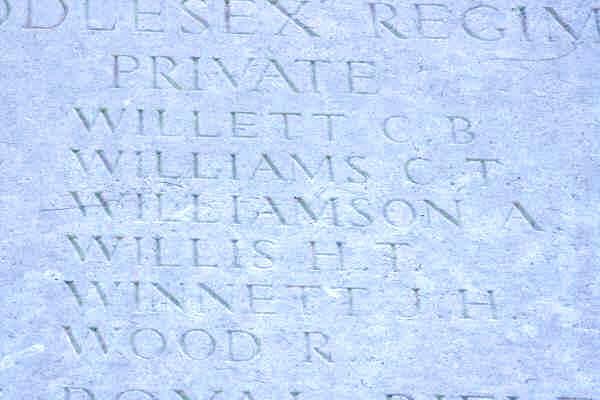 [Comparison with other men in the Regiment with similar Service Numbers suggests that Arthur would have enlisted around 11th/12th May 1915] However, when reporting his death "The Buxton Advertiser" (11th November 1916) stated that Arthur: "... joined the Colours nearly two years ago." It could be that he had joined as a Territorial, being called up later. The 13th (Service) Battalion had been formed at Mill Hill in September 1914 as part of K3 (Kitchener's Third New Army of 100,000 men) and attached to the 73rd Brigade, 24th Division. They moved to the South Downs and went to billets in Hove in December 1914 and then on to Shoreham in May 1915 and Pirbright in June. Final training took place at Aldershot from the 19th - 23rd June. Lord Kitchener inspected the Division at Chobham ranges on the 19th August and on the 20th it was inspected by King George V.
The Battalion received orders on the 19th August to move to France and the 13th Battalion, including Arthur, embarked on the 1st September 1915, landing at Boulogne the following day. The Division completed its concentration in the area between Étaples and St Pol by the 4th September. Having been in France for just a few days, Arthur and his Battalion underwent lengthy forced marches to bring it into the reserve for the British assault at Loos. It was too far behind the lines to be a useful reinforcement on the first day, but it was sent into action on the 26th September, when the Division suffered 4178 casualties with very little ground being gained. The 13th Battalion War Diary shows that on the 26th and 27th September 1915 it was in advanced trenches near Vermelles, but under shellfire from the enemy "... which had found out the exact range of the occupied trenches ...", necessitating the Companies having to move trenches often. About 5.00 p.m. on the 27th the Germans launched "... a heavy attack on the left ... which was repulsed by men of various regiments...". "Throughout Monday night these attacks were constantly repeated, but in every case were successfully met. 28/9/15 - About 8.00 a.m. the Battalion was relieved and received orders to withdraw - which it did by BART'S ALLEY. After a short rest, it marched through VERMELLES to SAILLY-LABOURSE, where it was visited by Major General J. Ramsey, Commanding 24th Division, who warmly congratulated the Battalion on the work it had done." At 8.30 p.m. that evening the Battalion was paraded and "… mustered 606 of all ranks. In pouring rain it marched to the NOEUX-les-MINES, about 3 miles, and was entrained about 12 .0 midnight and arrived at BERGUETTE STATION about 2.00 a.m. Wandering about in the dark it reached its billets about 5.00 a.m. at FONTES." The "FIRST CASUALTY RETURN from Sept. 25th - 29th" recorded 13 other ranks killed; 7 Officers and 77 O.R.s wounded and 1 Officer and 70 O.R.s missing. This turned out to be a rather optimistic assessment, however, as the CWGC records show that Arthur was one of the 1 Officer (Capt. Charles Edward HILL - previously reported missing) and 37 men killed in action on the 28th September. 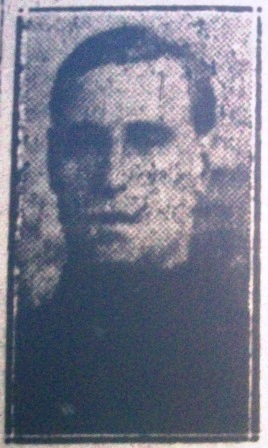 Arthur was initially reported missing, and his death was not confirmed in "The Buxton Advertiser" until November 1916. 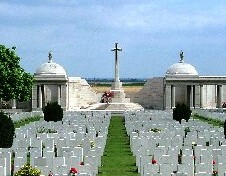 All that day's casualties, like Arthur, have no known grave and are commemorated on the Loos Memorial. · Another Buxton man, Pt. 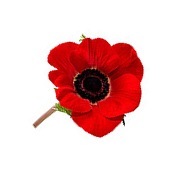 G/4854 Harry PORTER, of the same Battalion as Arthur, was killed in action on the same day. · I am grateful to Colin Taylor for the War Diary extract.